Movement Education is helpful in addition to Manual Therapy, to teach your body new patterns, so it can better hold the changes from Manual Therapy. Whether your body needs one specific reinforcement or many interconnected ones, I can determine your body's need with my assessment. My expertise is in discerning the most effective home program, so you spend the least amount of time with it and benefit with the fastest results. I draw from a wealth of training beyond my solid Physical Therapy education. My continuing education includes Yoga, Functional Mobilization™, Proprioceptive Neuromuscular Facilitation (PNF), Core Stabilization, Movement Re-education, The Feldenkrais Method®, Developmental Movement, Continuum Movement, Qigong, Authentic Movement, and Body-Mind Centering®. These movement therapies are all whole body approaches. When I work with children, I check and play with functional movement per developmental stage of their life. We often play on one of the therapy balls after CranioSacral Therapy, to reinforce their dural and fascial release. Young ones can sit on my lap while we gently bounce and roll, while older kids can sit and bounce on their own, with my support nearby. 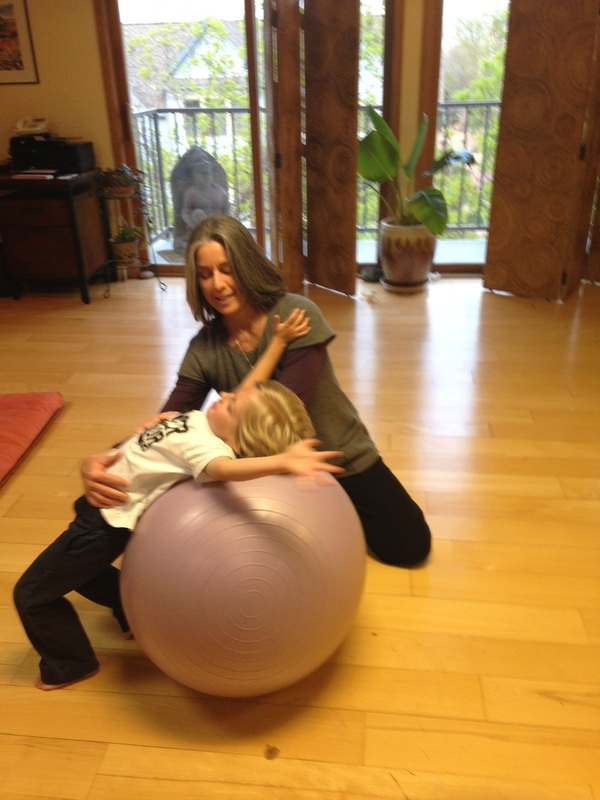 Once their tissues have released enough with CranioSacral Theray, older children enjoy learning to roll forward or backward over the ball, finding their hands and feet on the floor, with my support. 5 year old finding his hands! 5 year old finding his feet! Working with older adults, I assess for balance issues, since the risk of falls makes one susceptible to further health problems. My evaluation reveals whether balance loss is due to weakness in torso muscles, improper walking pattern, or head tension (a common response to health issues) causing lack of grounding in legs, or a combination. An appropriate treatment plan is then developed based on my findings. I delight in teaching adults to learn to walk properly again. Or, to learn to dance more easily! Commonly after injury (and especially with the use of a walker as part of rehabilitation), the walking pattern becomes more rigid, loosing the normal rotational quality of the torso and the reciprocal movement of the extremities. With neurological disorders or advanced arthritis, more complicated patterns may exist. I am an expert at breaking down the complexity of walking into simple exercises, that then are connected together as they are mastered by the body. Learning to move more efficiently is helpful for those physically challenged, as well as for those athletically inclined. My thorough assessment reveals the missing links to your performance, whether that is getting out of bed or completing your first race. "Germaine has helped me tremendously with everything from re-education of muscles as I learn to walk properly again after years of deterioration due to multiple sclerosis, acquisition and proper use of electrical stimulation equipment, stress reduction tools for everyday use, hands-on craniosacral work to improve my function and structure, as well as manual lymphatic work. She is a huge part of my continued recovery. Quite frankly, I would not be where I am today without her expertise and assistance! I am doing things I never thought I would do again!" T.B.